The difference between a deal and a promise is at the heart of Paul’s argument in this passage. In the 3:15-22, Paul begins with an appeal to everyday experience or common sense. The kind of common sense that even a child has because even child knows the difference between a promise and a deal. A deal is made between at least two parties. Both parties agree to certain responsibilities and certain consequences if either party fails to meet those consequences. A promise is based on one person only. One party pledges to do something regardless. 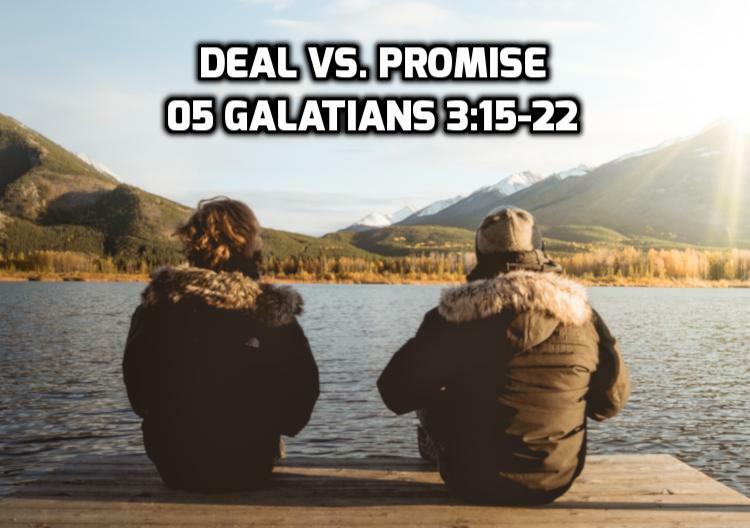 Paul argues that God made a promise to Abraham, but the Law which came later was a deal. And the deal does not nullify the promise. In 3:15-18 — he argues that the law does not annual the promise. In 3:19-22— he argues that the law illuminates the promise by asking and answering two questions: 3:19 Why the Law? And 3:21 “is the law contrary to the promises of God”.